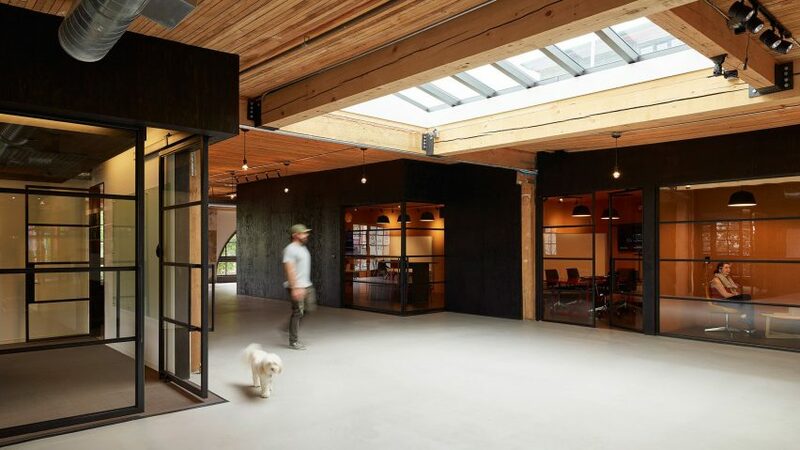 The office is located within the upper floor of a 100-year-old building in Seattle's Capitol Hill district. Encompassing 14,000 square feet (1,300 square metres), the space serves as a second office for Substantial, a digital product studio established in 2006. The company had occupied a portion of the floor since 2013, and decided to take over the full storey when its neighbouring tenant moved out. Local firm GoCstudio was charged with overhauling the entire floor, so it read as one unified space. "The challenge was to create a cohesive open-plan workspace which retained the feel of the original Substantial space and would maximise the existing character of the building – exposed brick walls, old-growth Douglas Fir beams and roof decking, and warehouse-style window walls," said the studio, which is led by architects Jon Gentry and Aimée O'Carroll. The architects worked closely with the client to understand day-to-day operations, as well as the company's love of hosting parties. Their research led to the conception of the office's signature element: The Forum, an assembly area for social and business activities. "A large aspect of Substantial's working practice is the hosting of public and private events," the architects said. "Creating a large social space that could be multifunctional was an important factor in the design of the expansion." Surrounding The Forum are conference rooms, with walls made of black-stained plywood and large panes of glass. Additional enclosures were inserted on the north side of the floor. A large portion of the office is given over to open areas with flexible workstations. In the kitchen, the team installed two bars made of cross-laminated timber planks, along with several black dining tables with colourful chairs. Employees can be found working here throughout the day. "The new architectural insertions allow a clear understanding of the space and circulation, while allowing employees flexibility in the way they work and interact with each other," the team said. The space is filled with natural light, thanks to large floor-to-ceiling glass on three sides of the building. "For the first time in many years, views are opened up through the building, from east to west," the studio said. Other projects by GoCstudio include a low-lying winery that blends with Washington's natural terrain, and a floating wooden sauna that can accommodate up to six people. Photography is by Kevin Scott.